The sirens and vixens of early films, boy, did they have exciting lives of glamorous days and exotic nights. Can a woman have too many stunning gowns or too much champagne? I think not. Celebrate those fabulous women and fabulous posters that promoted their movies. The postcard book has 18 cards ready to send. The 160 page, lined journal features retro movie posters, but the best part is its title. 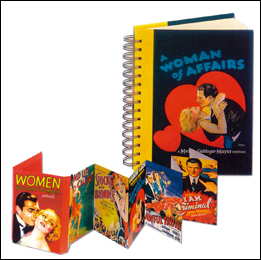 We bet you know “A Woman of Affairs” who just needs someplace to write about them.